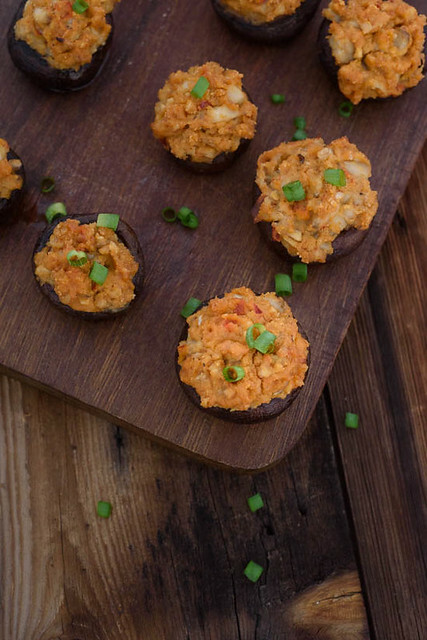 These healthy stuffed mushrooms are the perfect easy tailgating appetizer! Stuffed with hummus and so easy to whip up with just enough kick to keep you coming back for more! When Sabra asked us to partner with them to make up a delicious tail gating recipe I knew it was going to have to be manly. Tail gating=tons of men folk everywhere. It was pretty easy to decide that you can’t get a much more classic manly food than a stuffed mushroom. When we first got married we all lived on a giant commune living situation on my parents 20 acres. Both my brothers lived within a 3 minute walk from us which resulted in a lot of commune dinners. But neither of my siblings had their respective girlfriends at the time around much, so this often translated into the dudes doing all the cooking. Let’s just say their was a serious lack of vegetables and starches at these dinners. Whiskey and all the smoked meat you could eat. And….mushrooms. For some reason my younger brother decided it was his mission in life to perfect the stuffed mushroom and so we ate A LOT of mushrooms in those months. To be honest I haven’t made any since then because I was so burned out on them. But when we started playing with this recipe I had so many fond memories rushing back of that time. These will definitely have to be making an appearance at a family get together soon! I am absolutely in love with Sabra as a company and all their products! My boys would eat their weight in hummus each week if I let them. I love having an easy healthy snack for them on hand all the times for them (and lets be honest me too). 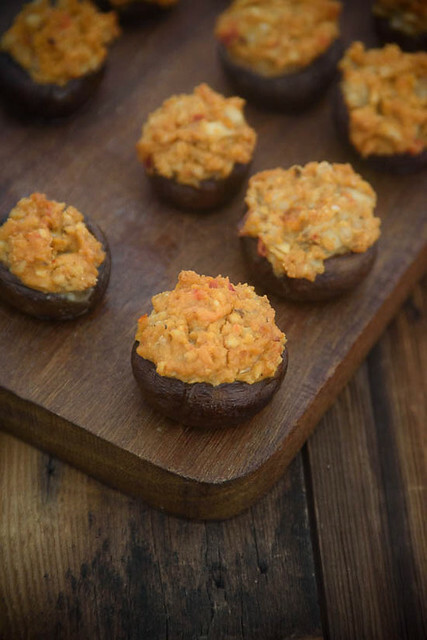 I used equal parts of Sabra’s Chipotle, Roasted Red Pepper and Supremely Spicy hummus to make these healthy stuffed mushrooms because that’s what hadn’t been stolen by said always starving boys in my house. But any of these three would have worked perfectly by themselves too. The kick was perfect, just enough to feel it but not so much that Noah was turned off by the “spiiiiiiccy”. He scarfed three of these in no time flat. I had made some awesome caramelized onions to go on top of these which we ate in all our tests and I totally forgot to add them in the photographs. So if you want to punch it up in the fancy department totally add those for an added flair. 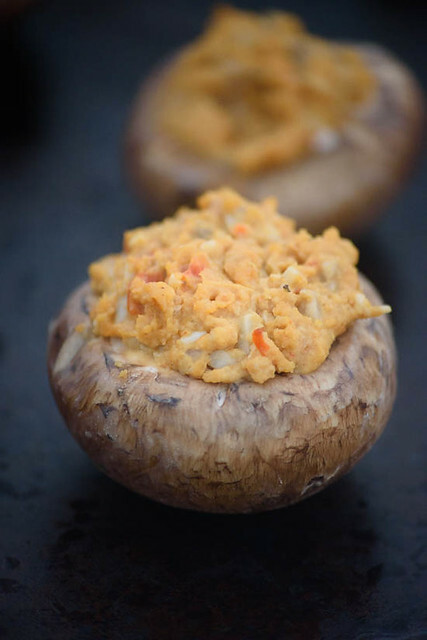 These healthy stuffed mushrooms are stuffed with hummus and are so easy to whip up with just the perfect amount of spicy! Great for game days and parties! Remove stems from mushrooms and chop stems finely. Saute the chopped stems in fat of your choice and add minced garlic. Cook for 3-4 minutes until stems have softened. Salt and pepper to taste. Remove to medium bowl. Add hummus and breadcrumbs and mix until combined. Melt butter and using a pastry brush, brush mushrooms with butter on bottom and sides. Place on a rimmed baking sheet. Bake for 10 minutes until mushrooms are cooked through. Add one or two optional toppings for an extra flair! Disclosure: This post was sponsored by Sabra. I was compensated for my time in developing this custom recipe for them but all opinions are my own. These sound so good! I love Sabra hummus and keep a container in the refrigerator to eat with pita chips but I love this idea of incorporating it into a tasty appetizer like these. So many great flavors in this recipe and so perfect for tailgating! Thanks for the comment Nidhi!! I haven’t seen Chipotle Hummus! Oh I need that! I hope your brother gets to try these! They look fabulous ! I could probably down several myself.